Designed to supply a sustained focused stream of vitamins and energy throughout the day. Time released delivery. No jitters, spikes or crashes. No bad tastes or odors. 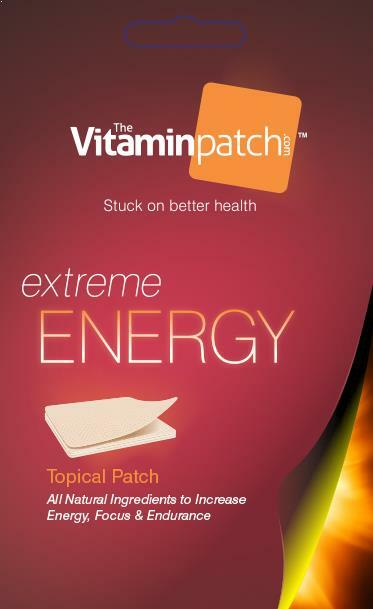 The Vitamin Patch Extreme Energy is designed to sustain a clear, focused stream of energy throughout the day. The all natural ingredients combined with our time released topical patch will not only get you through your afternoon lull but help support you right through dinner with the family. The best part is that the Extreme Energy formulation is designed to support your overall system on a long term basis and increase your natural energy over time. So STOP wasting your money on products that are only a short term fix that leave you feeling worse and START doing something that can provide what you truly need…focused, natural energy throughout the day! Vitamin B3 (as niacinamide) is the form of niacin that circulates in the bloodstream and is needed for the synthesis of energy (ATP), the activation of folate and the regeneration of glutathione. Vitamin B5 (as calcium D-pantothenate) is essential for the production of energy (via the Krebs Cycle), the synthesis of adrenal hormones, protein metabolism, and wound healing. Vitamin B6 (as pyridoxal 5-phosphate) has been shown to protect living lipids and proteins against glycation reactions. Aging results in the formation of advanced glycation end products throughout the body. Vitamin B-12 (as methylcobalamin) is an essential B vitamin for carbohydrate metabolism and energy production. It also plays an important role in the formation of healthy red blood cells. Agmatine Sulfate inhibits the enzyme that breaks down Nitric Oxide (NO). With increased NO, you create an environment for increased nutrient delivery, improved metabolic waste removal, and most importantly, increased overall performance. 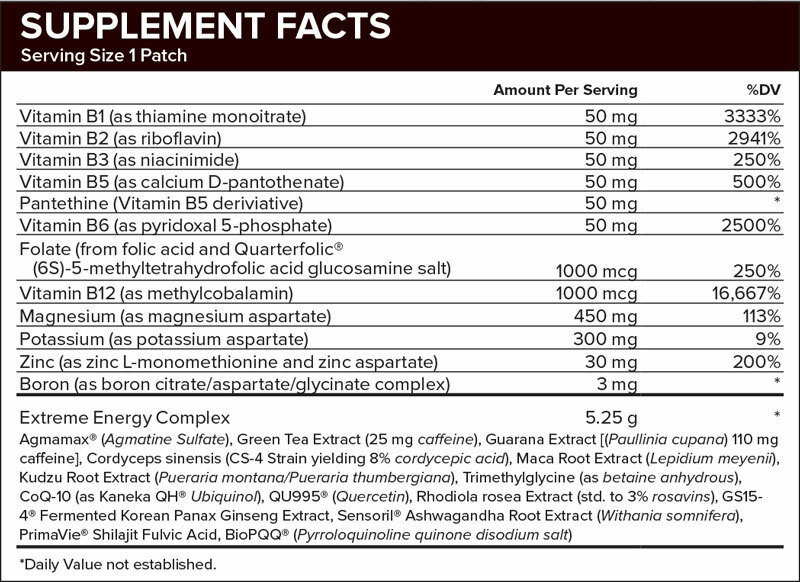 Research studies show Cordyceps sinensis increases ATP (Adenosine Tri-Phosphate) energy production and increases oxygen utilization. CoQ-10 exists in the mitochondria which are the tiny energy centers in each of our cells. Not only does CoQ-10 scavenge and destroys free radicals that cause cardiovascular problems and heart disease, it sparks energy production in every cell of your body including the heart. Several studies have shown Rhodiola rosea can dramatically reduce mental and physical fatigue under stressful conditions, by increasing the body’s energy levels. PQQ (pyrroloquinoline quinone) has been shown to induce mitochondrial biogenesis, the growth of new mitochondria in aging cells. While CoQ-10 optimizes mitochondrial function, PQQ activates genes that govern mitochondrial reproduction, protection, and repair.